The goal of the book is to provide anyone and everyone with the design tools to build more efficient, effective and elegant bamboo structures. During our travels while researching bamboo building practices, we had the opportunity to see bamboo being used by a wide variety of people in many different places around the world. Many of them did not personally know of others using the material for building and felt as if they had to more or less “reinvent the wheel” – trying many ideas by trial and error, some successful, others not. We felt that it was important to gather this information and compile it into this new book in order to prevent many more headaches and to encourage more people to use what we consider the strongest building material in the world. The book begins by laying out the basic principles from growing the right species for the climate through the best joinery to use in construction. Those principles are then demonstrated in examples of various contemporary projects – from small shelters in Eugene, Oregon to large scale pavilions in Colombia. What if there was a plant that could grow 4 feet in a day, with an ultimate tensile strength equal to steel, stronger than concrete in compression, requiring a land area for growth no larger than the building you want to build and replenished with that much building material each year; treated with laundry soap and eyewash, then put together with joinery so strong that the steel bolts are the weakest link? What if, as the builder, you could completely control your source of building material, so economic meltdowns and price fluctuations wouldn’t affect you? Not found only in Asia, in fact, the best bamboo building practices are found in South America where native bamboos have provided the basis for many thousands of years of civilization. In the push toward more sustainable building practices, our culture tends to first look at technology for answers before considering what has been there all along. 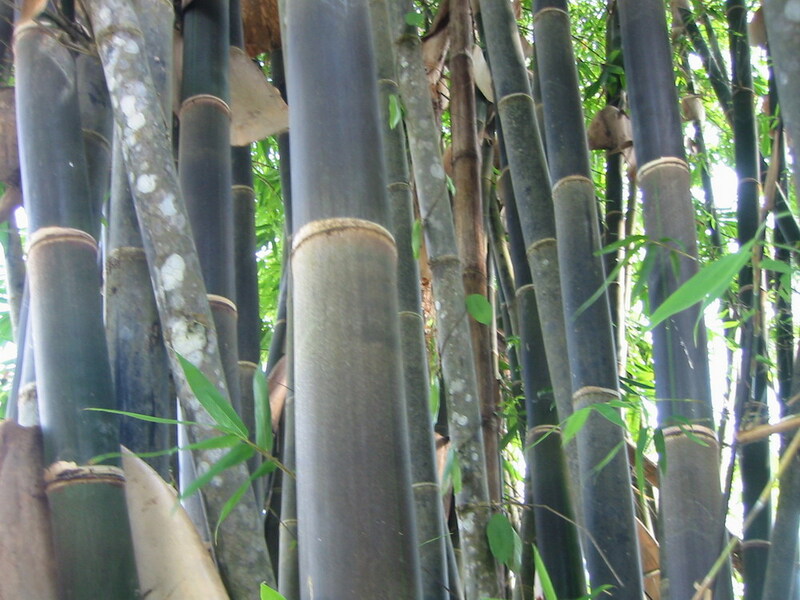 In the case of bamboo, whether you just appreciate its aesthetic quality or you need a plant to offset carbon emissions, or you predict high oil prices will soon force materials to be locally sourced, we hope to convince you that bamboo is the fastest growing, strongest plant fiber that can be most effectively used unprocessed – just as it grew. The goal of this book is to transform the way people think about and use bamboo. We would like people to take a deeper look at natural materials generally and see how they can be slightly augmented by simple technologies (bolts, mortar, treatment for longevity) and design (good layout, efficient joinery that doesn’t put too much load on single pieces) in order to make something that is hundreds of times better than either the traditional method or conventional building techniques. And what better time to change. For one, bamboo is readily available, simple to use, and if it used correctly, super strong, durable, and as green as it gets. Though humans have been building with bamboo forever, changes in the field over the last 20-30 years have made obsolete the image of the tiki hut. Today, engineered, thoughtful structures are within the reach of everyone. Oddly, the largest challenge in most of the world is exactly that inexpensive, accesible-to-all quality. The middle class moves away from bamboo to escape their association with poverty. It will be the lavish developments for the wealthy by people like Simon Velez of Colombia that will inspire those of all income levels to live in something locally produced, strong, durable and affordable. It is stronger than any other common building material when used in pure tension or compression and more sustainable due to its speed of growth and rate of carbon sequestration. Bamboo provides habitat and cooler temperatures when growing along with being one of the most accessible building systems ever invented. The question of bamboo is not why as much as how – how to implement it in countries (such as the United States) unfamiliar with the properties of the material, of the plant. To understand how is to fully understand the nature of the plant and how to put a round peg in our square way of thinking. Well behaved plants are those that don’t expand from where they were planted. Their job is just to be beautiful. Not since a hundred years ago when 90% of us were farmers have we seriously positioned plants as necessities in our landscapes. As the global reliance on oil becomes increasingly problematic, it is important to once again think of our landscapes as productive, as able to produce raw building materials. Tame, clumping bamboos can provide many of the bamboo needs, but there are many more species that are more cold-hardy and have different working characteristics as a group. They are the running bamboos that can emerge 4 meters from the parent plant in a year. North America and parts of Europe are the only places in the world where running bamboos are considered a problem. Everywhere else, they are eaten or used. The key to success is to know how to properly care for and manage running bamboo, as well as to accept its natural properties. Think of the positives – a well-thinned, beautiful grove of bamboo is a bonus in addition to the edible shoots and leaves that are more nutritious than alfalfa for livestock. All of the thousands of uses for bamboo are, and will soon be even more relevant. Now is the time to use bamboo where it is plentiful and plant where it will naturalize. The purpose of this book is to help an inexperienced designer/builder avoid the common mistakes and start to think of buildings that are uniquely suited to this material. A good design can make a building several times easier to build. The heart of the book will be the 11 principles. The examples that follow are beginning points in the journey to make even better bamboo buildings.